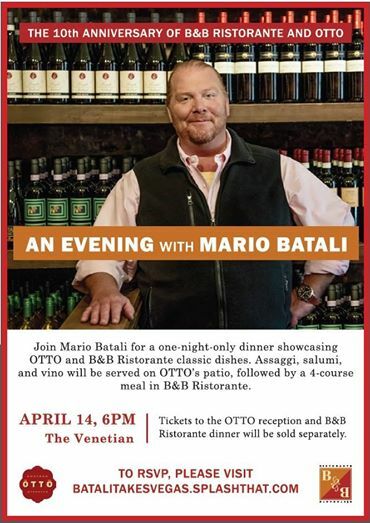 Beloved Celebrity Chef Mario Batali will personally be on hand to celebrate the upcoming 10th anniversaries of his signature restaurants B&B Ristorante and OTTO Enoteca e Pizzeria with a special reception and dinner. In addition, the restaurants will launch month-long special menus showcasing classic dishes. Guests will also be served Batali’s favorite cocktails: The Venetian Spritz (Aperol liqueur, prosecco, orange slice, olive) and Joe Bastianich’s Flor Prosecco. The price for the OTTO Enoteca e Pizzeria reception will be $50 per person; the four-course dinner at B&B Ristorante will cost $150 per person. Guests may also purchase a combined ticket to both events at the price of $175 per person. Click here to purchase tickets. Before the anniversary dinner—beginning April 1 and concluding April 30—B&B Ristorante and OTTO Enoteca e Pizzeria will offer month-long special tasting menus encapsulating the spirit of the restaurants when they opened in 2007. The price will be $99 per person; wine pairings can be added for an additional $99 per person. “Dishes like the Mint Love Letters have been favorites since we opened Babbo in 1998 (which was the inspiration for B&B Ristorante). I think I’d be banned from Greenwich Village if we ever removed them from the menu! The same can now be said for Las Vegas and B&B Ristorante,” concludes Batali. At B&B Ristorante, Chef Mario Batali and Joe Bastianich’s award-winning New York City-based Italian restaurant experience uses only the best local ingredients, treats them as artfully as possible then serves them with gusto. Batali and Bastianich have created an incredible menu paired with Italy’s finest wines in a simple and elegant atmosphere. Batali’s signature dishes appeal to all personalities, from the classic to the adventurous. Bastianich’s wine list showcases selections from every region in Italy, many of them available by the “quartino” (quarter-liter). In B&B Ristorante’s dining room, classical Old World charm meets the stylish appeal of the Las Vegas Strip. B&B Ristorante is located inside The Venetian Las Vegas. B&B Ristorante is open nightly starting at 5 p.m. For more information, go to BandBRistorante.com and follow on Facebook, Twitter and Instagram (@BandBRistorante). OTTO Enoteca e Pizzeria combines the vibe of an elegant Venetian enoteca with the energy of a crowded Italian train station. The menu is diverse and decadent, flexible and full of variety. Mario Batali and Joe Bastianich’s OTTO features an ever-evolving menu of thin crust roman-style pizzas, antipasti meats and cheeses, salads, pastas and main dishes, accompanied with a relaxed atmosphere that is perfect for a quick snack, big group or family night out. Pronounced oh-TOH, in Italian, OTTO means “8,” representing the restaurant’s original location on 8th street in New York. Enoteca is the term used in Italy for small, local or regional wine shops where guests may sample wines from area producers. OTTO is located inside the bustling St. Mark’s Square inside The Grand Canal Shoppes at The Venetian and is open daily from 11 a.m. to 11 p.m. For more information or to make reservations, go to LasVegas.OTTOPizzeria.com or call (702) 677-3390. Like on Facebook and Instagram and follow on Twitter (@OTTOLasVegas).